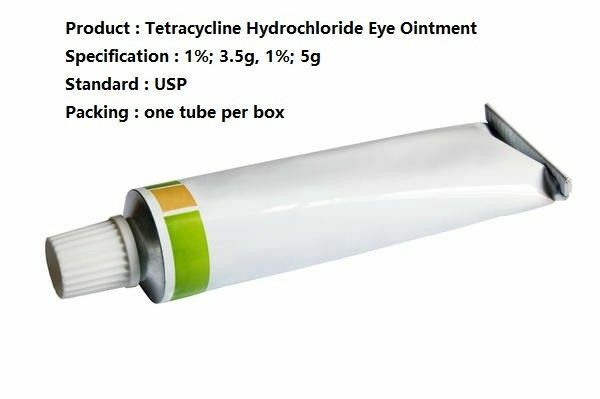 Tetracycline is a broad spectrum polyketide antibiotic produced by the Streptomyces genus of Actinobacteria. It exerts a bacteriostatic effect on bacteria by binding reversible to the bacterial 30S ribosomal subunit and blocking incoming aminoacyl tRNA from binding to the ribosome acceptor site. It also binds to some extent to the bacterial 50S ribosomal subunit and may alter the cytoplasmic membrane causing intracellular components to leak from bacterial cells. This medication is used to treat infections of the eye. It belongs to a class of drugs known as tetracycline-type antibiotics. This medication works by slowing or stopping the growth of bacteria. Do not wear contact lenses while you are using this medicine. Sterilize contact lenses according to the manufacturer's directions, and check with your doctor before you begin using them again. To apply eye ointments, wash hands first. To avoid contamination, be careful not to touch the tube tip or let it touch your eye. Tilt your head back, look upward, and gently pull down the lower eyelid to make a pouch. Place a 1/4- to 1/2-inch (0.6- to 1.3-centimeter) strip of ointment into the pouch, or use as directed by your doctor. Gently close the eye and roll the eyeball in all directions to spread the medication. Try not to blink and do not rub the eye. Repeat these steps for your other eye if so directed. Apply as often as directed by your doctor. Wipe the tip of the ointment tube with a clean tissue to remove extra medication before recapping it. If you are using another kind of eye medication (e.g., drops or ointments), wait at least 5 to 10 minutes before applying other medications. Use eye drops before eye ointments to allow the drops to enter the eye. Use this medication regularly in order to get the most benefit from it. To help you remember, use it at the same times each day. Continue using it for the full time prescribed. Stopping the medication too soon may allow the bacteria to continue to grow, which may result in a return of the infection. Use of this medication for prolonged or repeated periods may result in other types of eye infections, including fungal infections. Contact your doctor if you notice new eye symptoms. Before using tetracycline, tell your doctor or pharmacist if you are allergic to it; or if you have any other allergies. This product may contain inactive ingredients, which can cause allergic reactions or other problems. Talk to your pharmacist for more details. It is not known whether this drug passes into breast milk when given as an eye ointment. Consult your doctor before breast-feeding.